Gov. Matt Bevin claims to be a Christian. And while I’m not saying he isn’t, I don’t think much of his Christianity. Fine. Let’s talk about Gov. 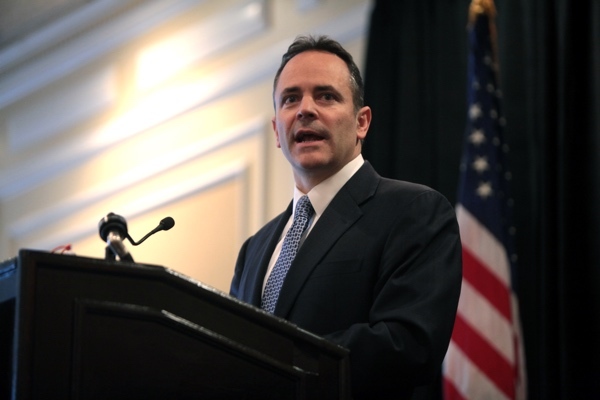 Bevin’s Christianity and its relationship to the Bible. He’s about to oversee, for instance, a new rule that would require those who are physically able to work 80 hours a month, either at a job, in community engagement, or in vocational training for the right to receive Medicaid. Such a regulation would mean that almost 100,000 people would find themselves dropped from the Medicaid roles. Some fraction of those who would lose healthcare benefits under this regulation are gaming the system. (Though we don’t actually know how many, we’re prepared to say that it’s probably a lot—because you know how poor people are <winks>.) Indeed, we find such cheating so objectionable (no matter how rare it is) that we’re willing to deny healthcare to tens of thousands of innocent people, just so we can be sure that we’re not being screwed by clever but morally deficient poor people. To be fair, Gov. Bevin and his supporters would most likely argue that requiring people to work for healthcare benefits is a good thing, insofar as it incentivizes personal industry and gets people out of the habit of expecting something for nothing. After all, Paul said that those unwilling to work should not eat (2 Thess. 3:10). But here’s the thing Gov. Bevin seems to have missed about what’s at the heart of Christianity: Jesus never attached negative moral valence to economic status . . . except to the wealthy who failed to use their resources to protect the economically vulnerable (e.g., the rich man and Lazarus, Luke 16:19–31; Jesus and the rich young man, Mark 10:17–31, etc.). Common mistake. Gov. Bevin isn’t alone in this misreading of the faith. It’s a theological staple for many white evangelicals convinced that they’ve enjoyed no extra advantages, and are thus both deserving of their own good fortune and convinced that their contempt for those who’ve not experienced good fortune is morally and theologically justified. Bad theology, but widespread nevertheless. What Gov. Bevin does that pushes him into another category of moral and theological reprehensibility, however, is what he threatens to do if he can’t force poor people to, you know, stop being lazy and get to work. Look, I don’t care how many Jesus fish you’ve got on the back of your car, or how many times you’ve sung Shine Jesus Shine, or how stirringly you can talk about orphans in foreign countries, if you refuse to help the people you have it within your power to help, then the Jesus you’re so publicly selling doesn’t have anything to do with the one found hanging out with lepers, giving sight to the blind, and holding the hands of the untouchables in the Gospels. I, and a number of clergy, have been to Frankfort several times over the past month with the Poor People’s Campaign, trying to make this point with him. He won’t even let us in the building. I suspect he doesn’t think much of my Christianity either. But the difference is, the Bible’s on my side.